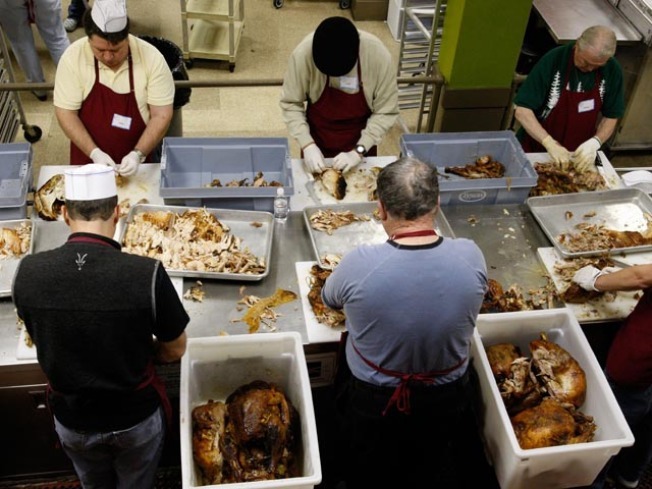 Nov. 21, 2007: Volunteers carve freshly roasted turkeys in San Francisco. The New York City Board of Health wants public comment on its proposal to give cleanliness grades to restaurants that would have to be posted for all to see. The board voted Thursday to solicit comment at a public hearing in February. The board plans to vote in March. Under the system announced earlier this year, the city's thousands of restaurants would receive a grade of "A," "B" or "C." The grades would be based on sanitary conditions observed during inspections. The city says if it gave grades now, about 30 percent would qualify for an ``A,'' 40 percent would get a "`B'' and 26 percent would get a "C."
The restaurant industry says the system could unfairly hurt an eatery for having one bad day. The city regularly posts restaurant inspection information on its web site. The letter grades would not effect the inspection process itself. It would just codify the inspection point system into a letter grade. Restaurants receiving 13 or fewer violation points would receive an "A." Those with 14 to 27 violation points would get a "B." Those with 28 and more would get a "C."
Restaurant receiving a "B" or "C" grade would not be required to post the letter grade right away. They will be given a month to rectify it and be retested. Even if they fail again, they will not be compelled to post the poor letter grade until they have administrative hearing with the city. The restaurant could post a special sign saying their grade is pending.